Dr. Ijaz Gilani, Chairman Gallup Pakistan/Gilani Reserach Foundation, delivering a talk on ‘Is Our Nation Fit for Democracy’ at PILDAT Office Lahore on January 25, 2018. The lecture was attended by prominent and influential personalities belonging to all walks of life such as Mr. Habib Akram, Executive Editor, Dunya T.V. 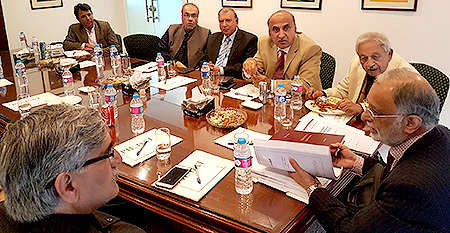 ; Mr. Sajjad Mir, Senior Journalist; Mr. Rehmat Ali Mujahid, Executive Director Institute for Electoral Studies and Former Senior Official of ECP; Mr. Javed Nawaz, Chairman, PILDAT Board of Directors; Engineer Sajid Nomani; Mr. Altaf Hassan Qureshi, Chairman PINA/Editor Urdu Digest; Mr. Ata-ur-Rehman, Senior Analyst; Mr. I. A. Rehman, Former Executive Director HRCP and Senior Analyst; Mr. Mujib-ur-Rehman Shami, Chief Editor Daily Pakistan; and Prof. Dr. Muhammad Waseem, Professor of Political Science at Department of Social Sciences, LUMS. The talk was held on the basis of Dr. Gilani’s upcoming book called ‘The Melodramatic Electoral History of Pakistan (1970-2013)‘ with the purpose of seeking clarity based on data on the voting patterns in the country. The book deduces by demonstration, an evolutionary trend in Pakistan’s electoral history, systematically analyzing 10 elections since 1970. The research uses polling data on the level of constituencies from Election Commission of Pakistan, and uses it to analyse division of vote bank on a federal and provincial level. According to Dr. Ijaz Gilani, if we look at polling data from the past 30 years, we see a constant evolution and consistency barring the 1977 election, and reflect the will of the people despite several arguments considering Pakistan unfit for democracy. The data shows a constant division of the vote bank between Pakistan Muslim League and their allies, and Pakistan People’s Party and its allies with PTI becoming a major factor instead of PPP since 2013 Election. Dr. Gilani’s upcoming book outlines a history of elections in Pakistan over the course of the ten elections, tracing an evolution, as well as reasons for it based on historical and political processes. He also narrates the rise and fall of political parties over the years. Key lessons from Dr. Gilani’s research predicts a slow and evolutionary advent of civilian supremacy through a firm adherence of the Rule of Law and the constitution, establishing a firm identity and solidarity as a political class and building up grass-root governments as the source of Building Political Parties. According to Dr. Gilani, 1970, 1997 and 2013 Elections marked the three most important milestones of Pakistan’s electoral history. He thought that in 2018’s election, there will be little to no change in the division of the vote bank despite a tumult in the political scenario in the country. In the end, Mr. Ahmed Bilal Mehboob, President PILDAT thanked Dr. Ijaz Gilani for discussing an important and relevant subject of elections in Pakistan and sharing such invaluable information. Dr. Ijaz Shafi Gilani is a prominent member of Pakistan’s intellectual vanguard, and a renowned academic. He holds a doctorate in Political Science from MIT and is a specialist in public opinion research. He pioneered the field of opinion polling in Pakistan and established the Pakistan Institute of Public Opinion, the Pakistani affiliate of the Gallup International Association in 1980. He is currently the Chairman of Gallup Pakistan and Gilani Research Foundation. I.A Rehman in a follow up question-answer session at a talk by Dr. Ijaz Gilani, Chairman Gallup Pakistan/Gilani Reserach Foundation on ‘‘Is Our Nation Fit for Democracy’ at PILDAT Office Lahore on January 25, 2018. From Left to Right: Habib Akram, Executive Editor, Dunya T.V. ; Mujib-ur-Rehman Shami, Chief Editor Daily Pakistan; Mr. Javed Nawaz, Chairman, PILDAT Board of Directors; Mr. Sajjad Mir, Senior Journalist, T.V. 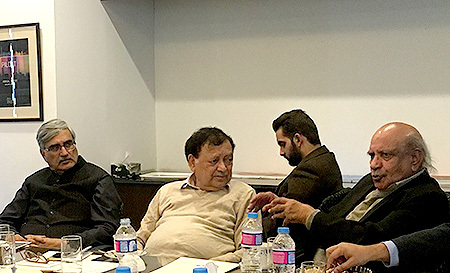 One; Mr. Ata-ur-Rehman, Senior Analyst; Dr. Ijaz Shafi Gillani Chairman Gallup Pakistan; Ahmed Bilal Mehboob, President PILDAT; Prof. Dr. Muhammad Waseem, Professor of Political Science at LUMS. From Left to Right: Habib Akram, Executive Editor, Dunya T.V. ; Mujib-ur-Rehman Shami, Chief Editor Daily Pakistan; Mr. Javed Nawaz, Chairman, PILDAT Board of Directors; Mr. Sajjad Mir, Senior Journalist, T.V. One; Mr. Ata-ur-Rehman, Senior Analyst; Dr. Ijaz Shafi Gillani Chairman Gallup Pakistan; Ahmed Bilal Mehboob, President PILDAT.